Tanzania is probably the country in Africa with the largest number of activities to do. You will be fascinated by various safaris (jeep safaris with a guide or self-drive, night safaris, balloon safaris, walking safaris and canoe safaris), amazing hiking and climbing experiences (e.g. the tallest mountain on the continent, Mt. Kilimanjaro), adventurous rainforest trekking to spot chimps and mountain gorillas – some of the rarest animals on Earth, astonishing cultural experiences to visit indigenous communities and meet the unique Maasai, Datoga, Hadza and numerous other tribes, and beautiful beaches to relax or enjoy some activities like snorkeling, diving, surfing and kitesurfing! But regardless of what you will be up to in this fascinating place, I want to share with you one of the most thrilling experiences I’ve had in my life: a walking safari through the African savannah! 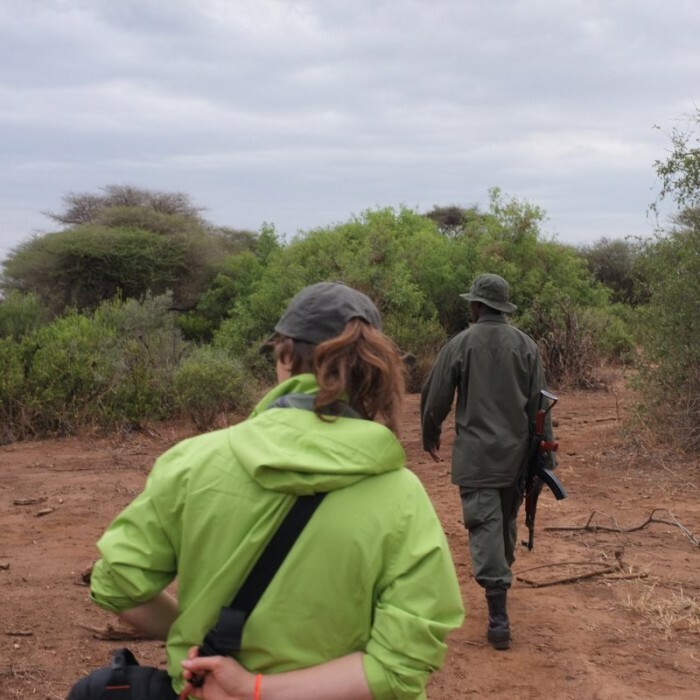 Usually walking safaris are not very common in Africa, as it is pretty dangerous to be on the ground with wild animals like elephants, buffalo, lions and others. However, in some places there is still a chance to do this, and I really recommend not missing out! Most likely your journey in Tanzania will be organized by a local operator, so you will have a guide and a cook traveling with you from one national park to another. One of the most common stops in the Northern Circuit is Lake Manyara National Park. There, you will have a half or full day to spot lots of baboons, birds, hippos, zebras, giraffes and, if lucky, elephants. But instead of just sitting in your vehicle, you can organize a walking safari there on your own! Just ask your guide to give you a few hours before noon or afternoon and drive you to the entrance. At the entrance, you will have to pay for the local park ranger (who will be your guide). They can also assist you in driving (maybe with your own guide-driver and your jeep) to the point where safari starts. From there, you will walk for 2-3 hours and come back to the meeting point where your driver will be waiting. The whole journey is not expensive and it comes to about $30-50 per person, plus some tips which are greatly appreciated by your local guides. You will be happy to pay this, as you’ll learn a lot of interesting and curious details about wildlife from your ranger! We did this safari in the afternoon. Around 3 PM, we drove from the entrance to the starting point with our own guide-driver Jolis, park ranger Jackson and his trainee Bobby. The guys were super friendly, made lots of jokes and were eager to give us tons of information about the animals! Finally, after 30 minutes driving we stepped out of the car and started walking into the bush. And after making couple more jokes he explained us that buffalo are the most dangerous animals in the bush. Their tongues are so rough that if one decided to lick your arm, after two licks it would penetrate right to your bone! Thus, the best recommendation was to just lie down on the ground and pray. If you do this, buffalo can just roll you over and hopefully lose an interest in you, since they’re herbivores. The good thing was that Jackson was carrying a Kalashnikov rifle, just in case. This way, if we came across a lion or an elephant, there would be a chance of survival. Of course we asked Jackson if he ever had to use his gun. He answered honestly and told us that he had to use it a few times when a buffalo was trying to attack him and his group of people. But besides these thrilling moments, we were happy to just walk through the bush and spot some antelopes, zebras, birds and lots of excrement! Jackson and Bobby taught us how to learn about animals by their excrement. For example, one time we found absolutely white poo and were a bit surprised. The guides explained to us that this poo contained lots of calcium and belonged to a hyena. Why? Because hyenas eat everything, including bones, and as a result their poo is white. We then asked why hyenas eat bones, and apparently mothers take care of their babies for about a year and it’s quite hard to feed themselves and their breed, so they really do eat everything they find to stay full. We headed down to the lake and came across a curious tree. Jackson cut off a stick and showed us how to use it as a toothbrush. As it smelled very nice and looked pretty decent, we all brushed our teeth, and of course everyone got his own brush! Trying to brush our teeth with a stick! But the biggest adventure was still ahead of us… When we approached the lake, Jackson suddenly fell to his knees and told us immediately to do exactly the same. As we couldn’t see anything in front of us, we just repeated after him. Then he started running on his bent legs with a very weird trajectory…. For me, this was pretty hard as I was carrying my big camera and zoom lens. He kept running for about 15 minutes. We were quite exhausted and a bit of confused, since he still hadn’t said a word. Finally, we stopped. Jackson explained us that he had spotted a group of 3 buffalo lying right in front of the lake, and we were right in their so-called ‘escape route’. In other words, we were in their way if they wanted to leave, as the lake was on the other side. So we basically went around them and hid in the grass. Jackson said that now we could stand up slowly and in a line, so that the buffalo could see all of us. We did exactly as he said. The gigantic creatures did notice us, and one of them stood up very slowly and started staring at us. This lasted for about 5 minutes. Jackson kept explaining that within these 5 minutes this buffalo was also communicating with his 2 buddies if it would make any sense to attack us or not. They were discussing which would involve using less energy: attacking or running away. We were 5 standing in a line, they were 3 and their escape route to the bush was now available to them. Then, the other 2 stood up and stared at us as well. Another 5 minutes dragged by. I swear, these 10 minutes were incredibly nerve-wracking for me, as I was literally facing a real force of nature… Then, suddenly, the buffalo turned around and bolted away. I would have never, ever imagined that these heavy and cumbersome animals could run so fast… Just amazing! After this we continued walking to the lake, and the reward was an astonishing sunset at Lake Manyara! 1. Proper walking shoes (men, women). I was wearing old keds – totally wrong choice for muddy and slippery soils. 2. Long pants (men, women) as bush is really cruel to your skin. I was stupidly wearing shorts… bad idea, as I got lots of scratches on my legs. 4. Hiking hat or cap. 5. Sunglasses if you do this during the day. 7. A pair of binoculars. 8. Good camera and good zoom lens. But these items are quite expensive, so if you don’t consider yourself as a starting wildlife photographer, just better to invest in a good binocular. 9. Some snacks like bananas or cookies to eat on the way back and share with the guides. 10. Hand sanitizing wipes if you have small wounds or scratches. 11. A bottle of water.